I hope you’ll forgive me this non-anime-related post. But I feel that we have to acknowledge the loss of a true visionary. 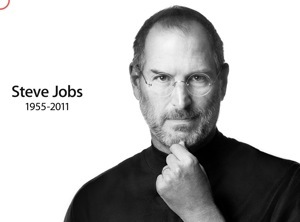 In a statement released late today by the Apple board of directors, they announced that Steve Jobs has passed away. I won’t say very much, because not only am I still in shock, but I really have nothing to add to what has already been said – there are far better bloggers and news outlets out there that are doing that, and I’ll link to some of them at the end of this article. Love him or hate him, agree with him or disagree with him, I don’t think there’s a single person on this planet who would deny that he made a significant impact on the computing landscape. He brought the user friendly to computing. And let’s not forget his impact on the music industry. Before the iPod came out, MP3 players (those few that existed) were big, clunky, complicated, and had battery lives measured in minutes. Now, with each successive generation of iPod and the inevitable copycats, we end up with better products — both the iPods as well as the copycats have improved. And the iTunes Music Store finally dragged the recording industry kicking and screaming into the age of digital music. Only Steve could have got them to agree to drop DRM. And his creations have directly affected many other industries — desktop publishing, digital video, telecommunications… I could go on and on. Many people have asked me why I use Macs and Apple products. My more frugal friends ask me why I insist on paying 2-3x of what the “other guys” charge for their tech. My Open Source advocate friends ask me why I persist in using a closed system. Well my answer is simple: Apple products do what I want and need them to do, and they do it well. I’m not necessarily saying that the other tools are bad — they serve the needs of many people just fine. But for my particular mindset, I just couldn’t think of doing it on anything other than a Mac. Apple kicked off the whole digital video revolution with products like iMovie and Final Cut, and while there are now some competitors in the space, I still think the Apple tools work better. The same goes for audio editing and digital photo editing. Yes they are more expensive than their PC alternatives. But they are built to last. I’m notoriously hard on technology, and I have managed to turn lesser (PC) laptops into nonfunctional, broken pieces of crap. (Just about the only laptop I haven’t managed to thoroughly destroy is the classic IBM Thinkpad.) Whereas my poor MacBook Pro has been dropped God knows how many times (trust me, it has the battle scars to prove it), yet still performs just as well as it did on day 1. It goes even farther than that. There are many people out there — including a certain Otaku no Podcast co-host — that still have more aged Macs that still perform beautifully (albeit a bit slowly by comparison), and these people use them every day. And there is one thing I cannot help but respect him for: he had the — well, there’s no other word for it, “balls” — to tell us “You’re gonna do things my way.” This can be summed up brilliantly in the “Think Different” ad campaign. He wasn’t always right — Apple has certainly had its share of titanic failures — but even still, out of the ashes of those failures came the seeds for later successes. Take the Lisa, for example. A technologically revolutionary machine, yet a commercial failure — but it formed the core (if you’ll pardon the pun) of the Macintosh. Or his NeXT machines — again, a failure in the marketplace, yet the operating system at their core went on to become today’s Mac OS X. Important note I have decided to donate all affiliate income earned during the months of October and November to cancer charities.